Robin Hood Gardens, is a residential housing estate in Poplar, London, designed in the late 1960s by architects Alison and Peter Smithson completed in 1972 and now scheduled for demolition. This was the only public housing project realised by the internationally influential and respected architects Alison and Peter Smithson. It is there for perhaps the archetypal Brutalist public housing project. In the 1950’s Alison and Peter Smithson coined the phrase ‘New Brutalism’ to describe their controversial style of modernist architecture. It was later shorten to 'Brutalism'. This style came to be recognised as the ‘look of the British welfare state’ as it became synonymous with council housing built in the 1960’s and 70’s in Britain. 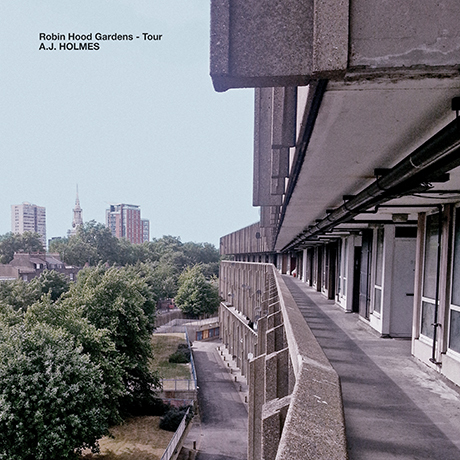 However, Robin Hood Gardens is not only of architectural and social significance, it is also of acoustic interest as from it’s inception the Smithsons were concerned with sound when designing the site. They designed sound reflecting walls around the site as a way of minimizing the traffic ‘noise’ as the site is situated between two major roads and the Blackwall Tunnel. In addition to this they designed concrete fins on the outside of the housing blocks to break up and deflect those sounds. Holmes suspects that the Smithsons also paid particular attention to the acoustic qualities inside the buildings on the site, designing high ceiling of class and concrete into the communal entrances and walkways, creating cathedral like reverbs in the spaces. Holmes would assume that the Smithsons were conscious of the acoustic virtues of the spaces they created, however this has been largely overlooked in most critiques of the site. In addition to this, due to a relatively large green central court yard being part of the design, the site has become something of - what one resident described as - a natural ‘oasis’. Holmes has made an attempt to document this, as the wild life will be irrevocably disrupted and displaced - much like the human community of the site - by the demolition. Holmes feels this too has been overlooked in discussions before the ‘regeneration’ of the site. On this tour, Holmes guides us through the main entrance of the east block, along it’s stairwells and on to it’s ‘streets in sky’ outside access decks and walk ways, down into the green central court yard, around the west block and along the sound reflecting wall to the approach of the Blackwall Tunnel. Holmes has also recorded a specifically composed collection of songs at the site, which will be released by Onomatopoeia records in spring 2017. Why this interest in post-war social housing? To Holmes they reflect a time of ambition by the state, to achieve greater social equality. The establishing of the welfare state, a concerted effect to progress British society towards 'Utopia'. A Utopia that seemingly notable political figures (such as Nye Bevan) believed achievable in the years proceeding the second world war. landscape. It is - literally in many cases - the last time we will be able to capture an 'echo' of this disappearing era.